After almost two weeks without new recipes I'm back again. I needed a little digital detox, to spend more time going for a walk, discovering new places to eat and watching movies with my sister at night without worrying about my 'to-do' list or if my e-mail inbox was too cluttered. I highly recommend everybody to spend a week unplugged, or at least to stay away from the computer as much as possible and try to not constantly check your phone. It might feel a bit weird the first two days but once you go out and explore new places, try new things, or simply dedicate some time to take care of yourself, you'll start to feel better. Recently my sleeping schedule has been quite inconsistent and I've had a very hard time sleeping, thus I woke up quite tired and grumpy. Spending time in front of the computer at night, writting blog posts or checking my Instagram notifications right before going to bed are the things I should avoid if I want to show that insomnia who the boss is! It's hard though, because most of the days the only free time I have to do some blogging tasks is after 10 pm. But going to bed super late is definitelt not the solution...so I must teach my body to adapt to new routines and, most importantly plus the hardest part, to shut off my brain before bedtime. One thing I've learned over the last two weeks is to avoid eating dark chocolate and/or sugar after dinner, it gives me quite a lot of energy and then I can't sleep. 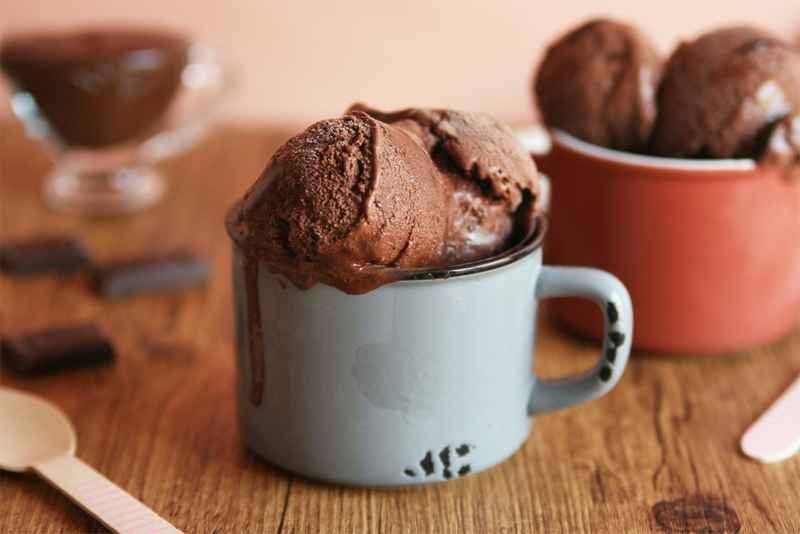 Like that night I decided to eat a big bowl of the Mocha Ice Cream I'm sharing with you today. 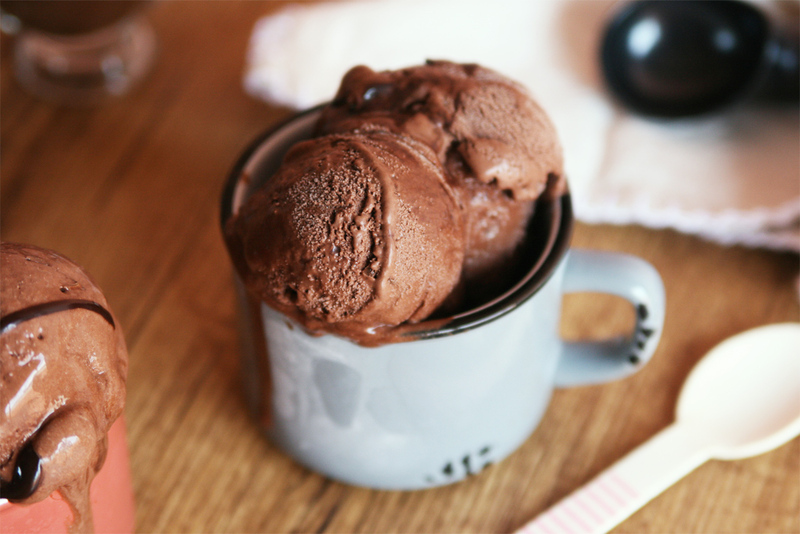 The dark circles in the morning were worth it anyway, cause this ice cream is so deliciously creamy and chocolaty! 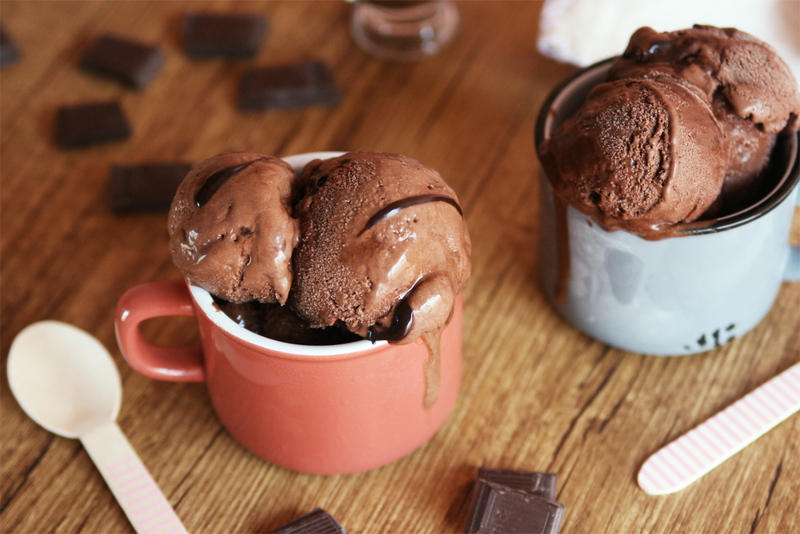 Any chocolate or coffee lover should try it before summer ends (owell, I'm one of those persons who still eats ice cream during winter). Chocolate and coffee are winning combo, everybody knows that, but if you're still hesitant about it then I encourage you to treat yourself with this ice cream. 2/3 cups unsweetened cocoa powder. 1/3 cup coffee dark chocolate, finely chopped. 5 tablespoons light brown sugar. 1/2 teaspoon instant espresso powder. * Notes: Coffee Fudge Sauce adapted from Fran Costigan's 'Thick Fudge Sauce' recipe. Place coconut milk, almond milk, light brown sugar, cocoa powder and vanilla extract in a blender and blend on high until combined. Carefully add in the xanthan gum and blend on low for a few seconds to prevent the xanthan gum from splattering, then increase the speed to high and process for 1 minute. Pour the mixture into an airtight container and refrigerate for at least 4 hours. 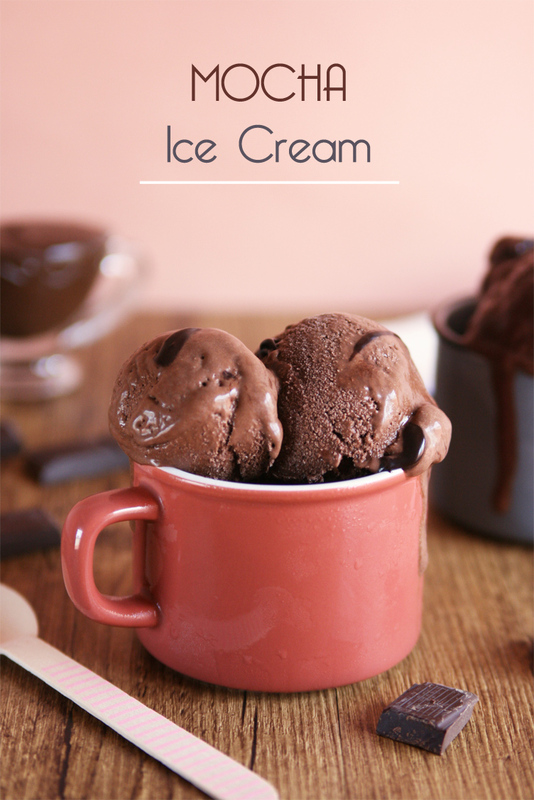 When the mixture is cold, give it a quick stir and pour it into your ice cream maker. Churn according to the manufacturer's directions, I usually churn my ice creams for 35-40 minutes. 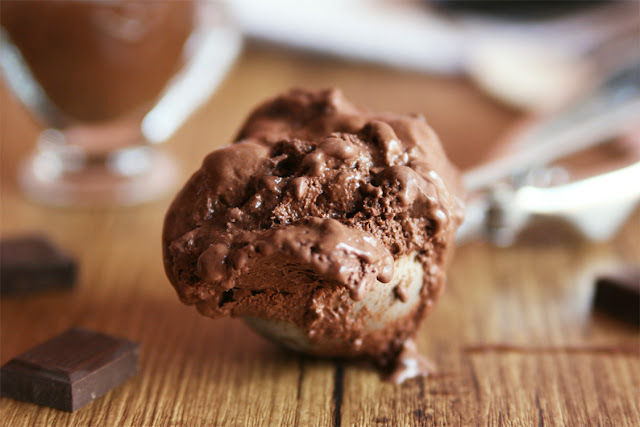 Transfer the ice cream to a freezer-safe container, stir in the coffee chocolate chips and cover with plastic wrap to preven ice crystals from forming. Close the container and transfer to the freezer. 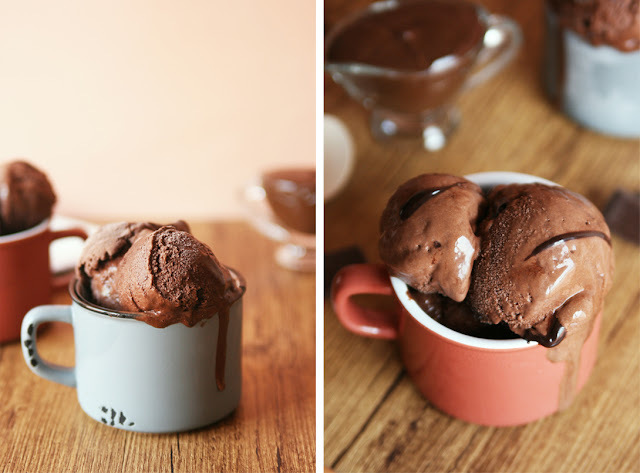 Once the ice cream is halfway frozen, stir in the fudge sauce, or alternatively pour it over the ice cream when serving. 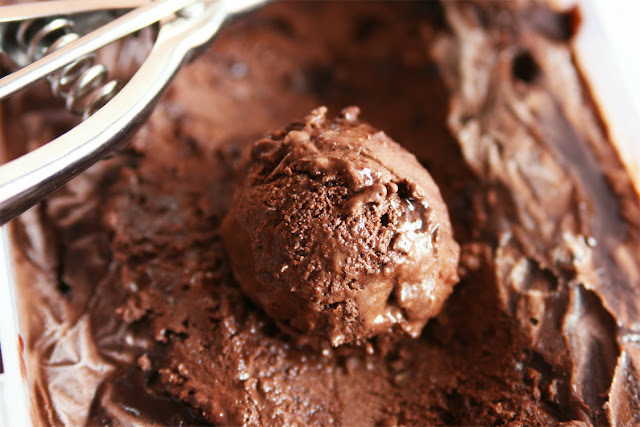 Place the cocoa powder and salt in a medium saucepan and combine. Pour the boiling water over the cocoa and stir with a silicone spatula. Let it sit for 5 minutes. Cook the mixture over medium-low heat for 1 minute and, whisking constantly, add the sugar, maple syrup, oil and instant coffee. Once the mixture begins to boil, remove the saucepan from the heat and finally add in the vanilla extract. Cool the sauce to room temperature and, if not using immediately, store covered in the refrigerator. The sauce will thicken as it cools so you might need to warm it in a bain-marie.